Indian cities should undertake planning processes that are appropriate for their particular size and needs. Photo by Ryan/Flickr. India’s urban population currently stands at 377 million, representing 31% of the country’s total population. This urban population is distributed across a diverse range of small, medium and large urban centers. Smaller urban centers – or ‘census towns’ that have recently crossed the threshold to legally gain urban status – have experienced an unprecedented 186% growth rate over the past decade, while larger ‘statutory’ towns have grown at 6% during the same time. The 73rd and 74th Constitutional Amendment Acts empowers local bodies to better plan and govern themselves and the Ministry of Urban Development Guidelines suggest 29 different types of plans, but neither address the differing needs, complexities, and growth trends of small towns as compared to large urban centers. This is also a weakness in state-level Town and Country Planning Acts that set the same legal framework for master plan preparation across urban centers. These master plans define a city’s land uses based on an assessment of future needs and apply development control regulations. Small towns should not be treated as scaled-down cities, and this blanket approach is an obstacle to effective urban planning. ‘Rightsizing’ can alleviate this by recognizing these important differences in size and complexity in policy, enabling more effective urban planning processes. According to 2011 census estimates, the state of Karnataka houses 347 statutory and census towns. These urban centers are required to undertake identical planning processes under the Karnataka Town and Country Planning Acts (KTCP). 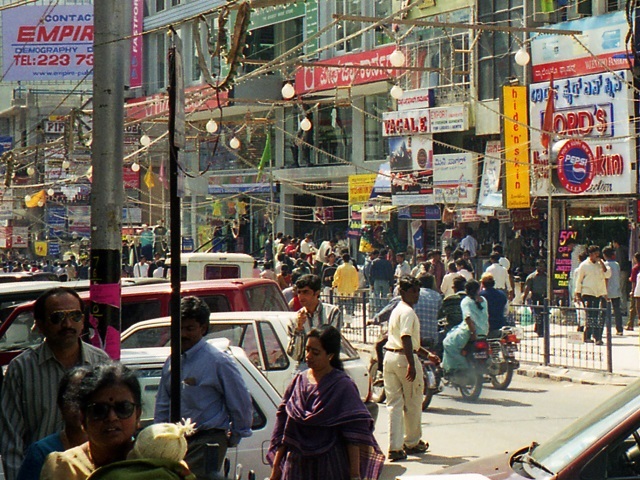 Bangalore is the state’s capital and largest city, housing over 8 million people. City agencies must provide services for a metropolitan area of over 800 sqaure kilometers, and face a range of issues including inadequate infrastructure, declining investment, lack of multi-modal public transport options, lack of affordable housing, environmental degradation, poor air quality, and prolonged traffic congestion. 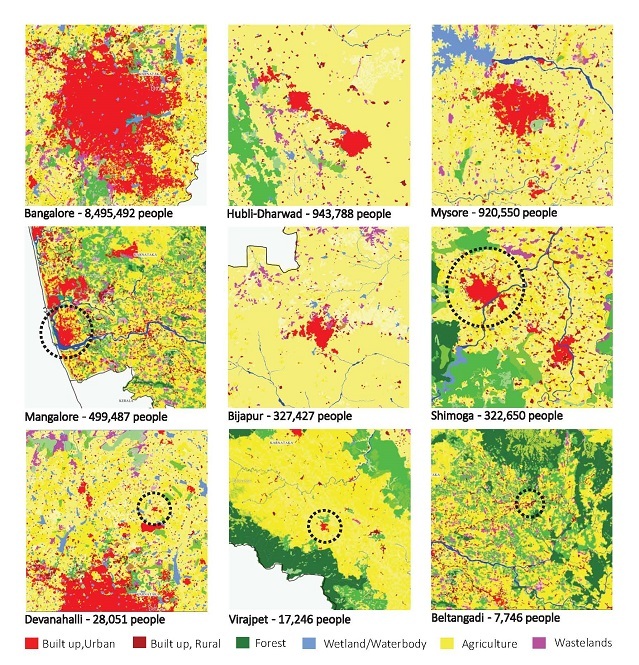 By contrast, smaller urban centers with populations of less than 8,000 such as Koppa, Narasimharajapura, and Beltangadi have economies reliant on a single sector or service, are struggling to become self-sustaining urban centers, and risk losing inhabitants to the lure of the larger city. The state of Karnataka has a variety of cities of different sizes, contexts, and layouts. Should Bangalore at 8 million people and Beltangadi at 8,000 be forced to follow the same urban planning standards? Graphic by Rejeet Mathews and Tintu Sebastian/EMBARQ India. Data from Bhuvan. While larger cities have the technical capacity to plan for themselves, smaller towns are dependent on plans from the state’s centralized Town and Country Planning Department. The significant surge in new census towns adds pressure to create master plans similar to that of a big city as per the KTCP Act that end up being unattainable. Although 98 master plans have been prepared for urban centers in Karnataka, their implementation has suffered from lack of qualified staff, poor inter-departmental coordination, and resource constraints. Large cities facilitate access to resources, technological advancements, efficient labor markets, and contribute to a tremendous share of national and state GDP. As such, their urban planning frameworks should vary from those of smaller cities facing different challenges. Cities in the United Kingdom and China, for example, accord special status to large cities. London doesn’t stop at a spatial master plan for the city; it also prepares an economic development strategy and a transport development strategy to retain its global competitive edge. Larger municipalities in China such as Beijing, Shanghai, Tianjin, and Chongqing have been accorded provincial status and hence are able to directly interact with the national government and employ different taxation norms. These municipalities with provincial status can implement local laws, regulations, and exercise unified administration over the economic, social, and cultural affairs in areas under their respective jurisdictions. Large urban centers: Large cities that have more than 8 million people and contribute significantly to the state and national GDP – like Bangalore – should be accorded a special status. They should follow a richer planning process and be required to prepare connected and complementary spatial, economic, and transport plans that better suit the city’s needs, complexities, and aspirations. The 73rd and 74th Constitutional Amendment Act has set in motion the revision of Town and Country Planning Acts in several Indian states, and this revision is particularly important as more rural towns gain legal status as urban areas. Now is the time for such documents to incorporate planning processes that are more responsive to the needs of urban centers based on their size and the complexity of the issues they face. Editor’s note: The title of this article was updated on October 9, 2014 to increase clarity.